I don’t care who you are, what you think about rap music or what you originally had planned to do tonight. You need to stop and go see “Straight Outta Compton” right now. The soundtrack is awesome. The actors are incredible and good looking. And the dialogue is pointed and funny. Most importantly though, this film managed to capture some of the most important moments of the last 30 years while still presenting a human view of what the black community is experiencing today. Reality check – the #blacklivesmatter movement is not your grandmother’s civil rights movement. The rise of rap music propels the story of the American streets; the HIV epidemic in the black community; the Rodney King beating and the resulting riots; and the plight of gun violence and drugs in the inner city. These are the pillars of “Straight Outta Compton.” Rarely have I seen a movie give such an honest view of such important and complex topics without trying too hard. “Compton” presents these issues through its surprisingly likable, tenacious cast. The young actors transform known rap gods into what they perhaps truly were – young boys trying to escape the struggle. 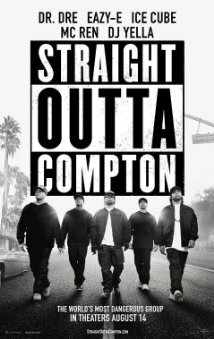 On the screen they are rendered human: Ice Cube is too talented and too smart for high school; Dre is a musical genius, but above all a man who is connected to his family; and Eazy is loyal, savage, trusting and beautifully flawed. But the best part of “Compton” is its honesty. Even with a large cast, the audience feels engaged and connected to each character’s struggle because those struggles are so human. Beyond its stand alone value as a movie, it also comes at the perfect time for the world to witness what parts of the black community have experienced over the last 30 years. Even as it tackles heavy topics, “Compton” still delivers laughs that make it more than a stressful lesson in street history. Let’s talk about that “Bye Felicia” moment. Oh wait, you have to see the movie first. Get on that. I hope great things are in store for “Compton.” This film could be a serious contender for best picture and maybe, at the very least, lauded for being the right movie at the right time.